When Finance Minister Pranab Mukherjee presents the United Progressive Alliance (UPA) government’s first full budget in its second term, he may in some ways be presiding over a tipping point. The Indian brand of high public spending on social welfare has gradually started showing results, although they are still patchy. India has committed huge capital to development. It must now strengthen the framework in which it operates its human development programmes. G-20, the high council that replaced the G-7 as the world’s top agenda-setting body. As the country’s chief economist Kaushik Basu told Forbes India in an earlier interview: “India is becoming, whether we like it or not, a fairly major player in the world and as a consequence we are charting into a terrain of policy formulation that we are not familiar with.” But unlike in the past, socialist policies have better acceptance in the world today and fiscally India is playing from a position of strength. “For the first time, we are not tied down by balance of payments. We are not aid-dependent and capital is not an issue. India can achieve whatever it wants,” says Bimal Jalan, former governor of the Reserve Bank of India. If India can show that a robust public sector can go hand in hand with modern markets and private enterprise in fuelling equitable growth without creating economic imbalances, it will be a model to copy for developing nations. To achieve that, however, it must hurry to fix its marquee projects. The government response has typically been to plough in more money into these schemes. However, human development issues widely vary from state to state and more money is not always the answer. Often the challenge is building local institutions and managerial capabilities. “Seventy to 80 percent of the human development problems are concentrated in eight to 10 states,” says K.P. Kannan, professor at the Centre for Development Studies (CDS) and member of the Arjun Sengupta Committee on the unorganised sector. While a state like Kerala boasts of human development indicators that are sometimes on par with developed countries, Uttar Pradesh and Bihar’s indicators are as abysmal as of some impoverished African nations. As the schemes mature, they should become more nuanced to adapt to the needs of each state and region. Kerala, for instance, has more old people compared to, say, UP. So what the southern state needs is an affordable pension scheme more than money for primary education, which is already institutionalised and working relatively well. The government would also need to plan for the structural shifts its development projects would entail. Balram Yadav, managing director of Godrej Agrovet, says that labourers who went home during the festival season never came back. The NREGS arguably the country’s most controversial and successful-in-parts social security plan, was recently renamed as the Mahatma Gandhi National Rural Employment Guarantee Scheme. The government is now planning to use NREGS as the pivot around which other social security schemes such as the National Rural Livelihood Mission will be built. Crafted mainly by economist Jean Dreze and activist Aruna Roy, NREGS was received with much enthusiasm in many states such as Rajasthan and Andhra Pradesh. Since its inception in 2006, NREGS has managed to lift the wage rates in many parts of the country. Y.K. Alagh, chairman of the Institute of Rural Management Anand (IRMA), has pointed out that the biggest impact of NREGS has been that it “has liberated the agricultural labourer from the tyranny of the land owner, who has exploited the labourer for ages”. It has also helped slow migration from villages. For instance, in the remote district of Balaghat in Madhya Pradesh, distress migration fell from 4,217 in 2005-06 to 2,840 three years later, mainly because locals found jobs under NREGS between the two major crop seasons of Rabi (spring harvest) and Kharif (autumn harvest). Nevertheless, there are issues. Ashok Vardhan Shetty, principal secretary to the Tamil Nadu government, wrote to the central ministry of rural development in December 2009 that NREGS had helped his state desilt and de-weed canals, ponds and irrigation tanks, boosting agriculture productivity. It had also helped raise the minimum wage levels for 86 lakh landless labourers of the state, which has been one of the better implementers of the central scheme. Yet even it has managed to spend only a little more than half of the funds available to it. The overall spending under NREGS is close to Rs. 28,000 crore so far this year, providing nearly 2.16 crore person days of work. Currently, there are about 23 lakh ongoing works under the scheme. But the system is weighed down by paperwork and workers have begun to shy away from the scheme as payments are getting delayed by months. NREGS workers in Khunti district of Jharkhand were reportedly not paid for two years. It took Dreze to camp there and lead a legal campaign last year to bring back NREGS on track in the district, clearly showing up the lack of institutional mechanisms at local levels. Such delays are pushing workers away from NREGS and some are going back to working for lower but timely pay. An official in the ministry of rural development, which runs the programme, says one of the major issues is lack of technical and accounting know-how and banking facilities at the village panchayat level. Village power structures, mostly caste-based, also appear to influence critical decisions. For instance, in Palanpur in Uttar Pradesh, the works were decided and controlled by the block officer instead of the villagers. If inadequate payment mechanisms and technical expertise plague NREGS, rural healthcare is handicapped by lack of managerial and planning capacity. India has tried to fight public health challenges with antibiotics and has, therefore, not succeeded, unlike the West, whose battle was won by clean water and sanitation,” Amarjeet Sinha, who runs the National Rural Health Mission (NRHM) from his perch as joint secretary in the ministry of rural development, said in a paper presented at a conference on human development recently. The health mission has had a good start in some states. In Tamil Nadu, the number of public health centres that were open 24x7 shot up from 180 in 2005 when NRHM started, to 1,215 now. In Bihar, which is one of the 18 high-focus states under the mission, the Nitish Kumar administration has used the funds to hire doctors and nurses on contract and outsource diagnostics in public hospitals to private parties. State health secretary C.K. Mishra says, “The biggest challenge was to get people to government hospitals.” That is because public hospitals did not have doctors, nurses, drugs or diagnostic equipment. That has changed after Bihar hired 1,800 doctors on contract at Rs. 30,000 per month using NRHM funds. To provide safe institutional delivery, Bihar paid Rs. 1,400 and free transport under the Janani Suraksha Yojana to each pregnant woman who chose to deliver in public hospitals. 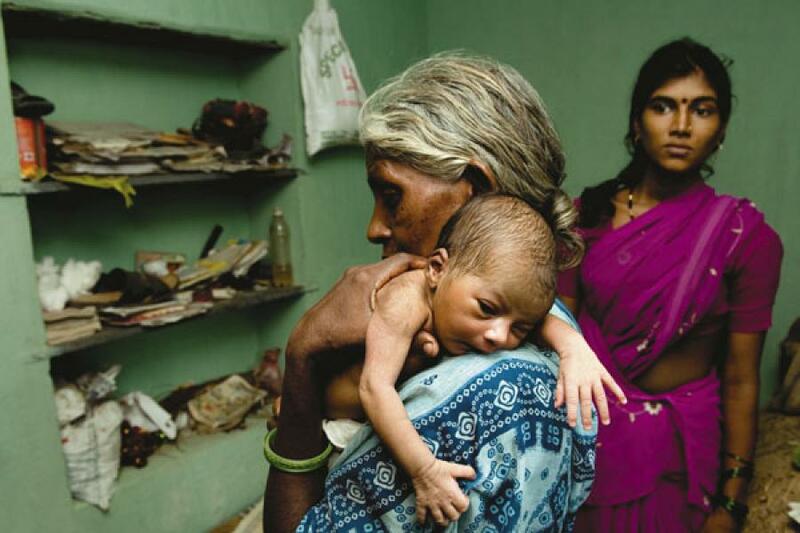 The number of women giving birth in such hospitals has shot up from 45,000 in 2005 to 13 lakh now. Still, the high-focus states, including Bihar, remain laggards in using central funds. In the first eight months of this fiscal year, they had collectively used only 70 percent of the funds. Lack of local-level institutional planning has left a large amount of untied funds unused. Bihar’s public hospitals and health centres have used only Rs. 13 crore of the Rs. 137 crore given to them this fiscal year. This lack of absorption capacity has rendered many schemes only partially effective at village and block levels. Himanshu, who teaches economics at Jawaharlal Nehru University, says that wherever infrastructure and a well-functioning set-up is available, people will choose to go to public healthcare centres. “Overall, I don’t think it [NRHM] has been very successful. It has been successful in those areas where there has been a multi-pronged approach,” he says. Amarjeet Sinha says that the mission is on the right track and has managed to start good community monitoring systems in nine states. “The challenge of NRHM is to craft credible public systems and this would also call for new systems of public recruitments which are institution specific and based on service guarantees with complete local level accountability,” he said in the paper. NRHM is only four years old. Even though the government announced it in 2005, it actually took off only the next year. However, the Sarva Siksha Abhiyan to provide universal primary education started much earlier. Yet, it has not been able to tackle some crucial issues such as the shortage of quality teachers. What’s more, by inducting para-teachers, who are not as qualified as regular teachers, the scheme has also diluted the quality of learning. Ghasi Lal Bairwa, a 40-year-old mason in Jaipur, sends his four children to a private school. During exams, he also organises private tuitions for them. Bairwa says he sends them to private schools because they offer better quality education compared to government schools. While the quality of infrastructure and learning is poor in most public-funded schools, over the past several years the government has stepped up efforts to reverse the sliding standards in its elementary educational institutions. The Sarva Siksha Abhiyan (SSA) had a budgetary allocation of over Rs. 13,000 crore last year. A lot of that money has been spent on constructing schools or upgrading teaching aids. “When I visit villages, I see that the best buildings are often the school buildings,” says P.V. Indiresan, a former director of IIT-Madras, who has advised government on education. Many government-run schools have seen children enthusiastically turning up. But many are drawn to the school by the lure of a free mid-day meal and attendance is no sign of their actually learning. Former Planning Commission member B.N. Yugandhar, is caustic in his criticism of the education campaign. “SSA is the biggest fraud. There are no curricular standards, no pedagogic standards. Would any one of us ever send our kids to be taught by a para-teacher?” Yugandhar asks. 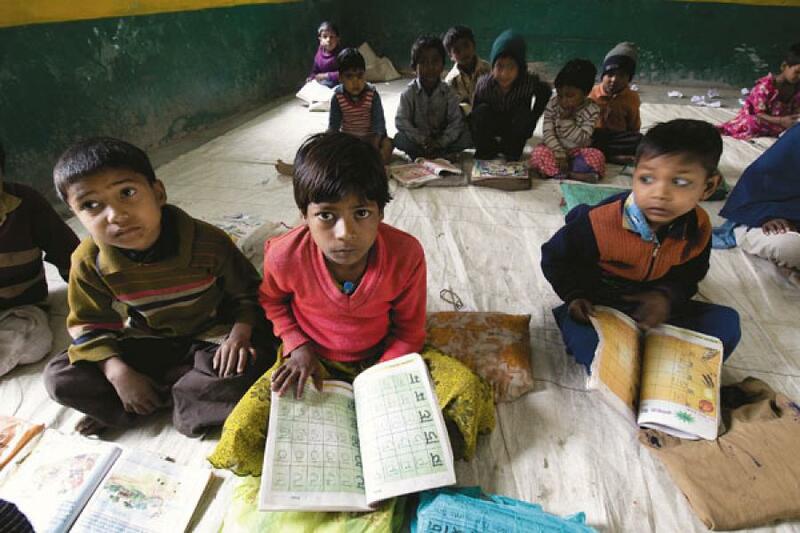 The latest Annual Status of Education Report, an yearly study by NGO Pratham to estimate the status of children’s schooling and basic learning, says that there has been some improvement in learning levels in Standard I but there are no major improvements in learning levels of children in Standard 5 compared to the previous year (2008). The percentage of children in Standard V in government schools who can read Standard II level text has actually come down to 50.3 percent in 2009, compared 51.4 percent three years ago. So has the percentage of students who can solve a division problem. The conclusion is clear: While more money towards infrastructure is important, money alone is not sufficient. The system needs some change. Many say it is the lack of accountability, empowerment and political incentives at the local level. Teacher absenteeism is high in government schools. (Salary is not an issue. Government school teachers are paid well, and it’s a lucrative profession, especially in rural areas.) While the SSA framework talks about making information such as funding public, there is no way to know how a school is performing compared to another. difference to schools, but there is hardly any training for them, says Dileep Ranjekar, who runs the Azim Premji Foundation. The problem goes up one level higher. Politicians at the ground level have hardly shown any concern for primary education. “As a country we have not devised a system to reward a politician for providing better primary education in his area,” says Nachiket Mor, President, ICICI Foundation for Inclusive Growth. Lack of public systems and credible institutions is one of the principal reasons for delivery failure of most government-sponsored schemes. “We need to create institutions and empower the institutional heads,” says former RBI governor Jalan. He points to the success of institutions such as the Election Commission that has held public-funded free and fair elections. “Why should the nation depend on what a particular minister thinks the policy should be? Why should the education policy or power policy depend on the whims of a minister?” Jalan asks. Krishna Vatsa, UNDP regional advisor for South Asia, says that institutional mechanisms for implementing schemes need considerable investment. Vatsa says that programme evaluations focus largely on expenditures, targeting, and delivery. They do not focus on capacity assessment and institutional strengthening. “The Indira Avas Yojana could have been a very important rural habitat programme but it is limited in scope, largely due to inadequate support structure,” he says. There aren’t engineers or technology demonstration units to educate the villagers about building skills, appropriate building materials, hazard- resistant design, etc. Even a programme aimed at mason’s training under the ambit of Indira Avas Yojana would have made a difference to the quality of houses. Vatsa contrasts it with the rural roads project. The Prime Minister’s Gram Sadak Yojana is a programme that introduced a comprehensive system of checks and quality controls. “It has delivered more effectively just because we have taken some care in devising the scheme and implementing with adequate care,” he says. Often the reason for the mercurial performance of these schemes is the way political parties look at government projects. Dreze and Roy, the champions of NREGA, boycotted the anniversary celebrations of NREGS early this month. “We see little point in attending ceremonial functions as members of the Central Employment Guarantee Council even as the Council’s substantive work is at a virtual standstill,” they are reported to have said in a letter to rural development minister C.P. Joshi. The late realisation that NREGS was one of the major factors that returned it to power seems to have prompted the Congress Party to get some mileage out of it. The government amended Schedule 1 of the Act that lists the works that can be undertaken to include construction of the Bharat Nirman Rajiv Gandhi Sewa Kendra. Dreze and Roy objected to it saying that it was a dangerous step towards displacement of labour-intensive NREGA works by material-intensive works. The top- down construction programme would likely be a new entry point for exploitative and corrupt contractors, an associate of Dreze quoted them as saying. The explicit political advantages in such welfare schemes often hobble them because politicians tend to have a short-term vision. “A problem that all democratic systems have to contend with is that for politicians it is more important to be ‘seen’ to be doing things, than doing things. Also their horizon of policymaking is short, defined by the electoral cycle. Good economic policy often requires us to take a longer view, of say 10 years or even 20,” says chief economic advisor Basu. The UPA government is now planning to hitch another programme to the NREGS. It is revamping the Swarnajayanti Swarozgar Yojana into the National Rural Livelihood Mission (NRLM). 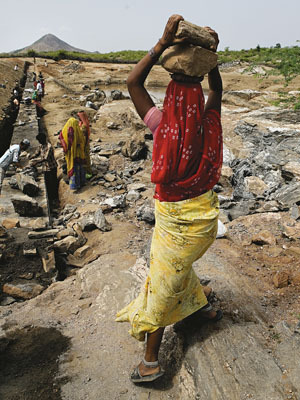 The NRLM hopes for convergence with NREGS by forming self-help groups (SHGs) of NREGS workers at their worksites and giving them skill training for shifting them from unskilled to skilled labour and involving them in various processes of NREGS, a source at the rural development ministry told Forbes India. The mission hopes to reduce poverty through promotion of diversified and gainful self-employment and skilled wage employment opportunities resulting in appreciable increase in incomes of the rural poor on sustainable basis. The core agenda of NRLM will be promotion of livelihood security for the rural poor through universal social mobilisation and financial inclusion, training and capacity building for self and skilled wage employment and facilitating the rural poor in setting up micro enterprises. The mission hopes to achieve this through SHGs with active participation of women. It hopes to form 25 lakh below-poverty-line SHGs in addition to the existing 20 lakh SHGs. The SHGs will be supported by a combination of bank credit and government subsidies. Even the NRLM is likely to run into execution issues as it depends heavily on banks. For instance, it proposes that banks will help in training and capacity building in villages. It also puts the financial burden of running dedicated training institutes for rural poor (one in every district) on banks. While in theory it may sound good, it is not wise to use financial institutions for training and running institutes. Also, the banking system does not have enough reach and the existing branches are overstretched by other government schemes such as NREGS. Whatever be the inefficiencies in the system, when the government spends such massive amounts of money on welfare, it does raise incomes and consumption, pushing farmers and factories to produce more. A January report by equity researchers at broking firm India Infoline estimates that government spending on rural areas will rise to nearly $50 billion by 2013. They also see rural consumption, powered by rising farm and non-farm incomes, rising to $200 billion in 2010. The researchers, who visited 18 districts across seven states, have identified 30 listed companies in various sectors, including auto, telecom, farm equipment and banks that will likely benefit from the rural consumption story. It would not require more money. In fact, India’s spending on social sectors has stagnated by some measures. Head of the Centre for Study of Regional Development at Delhi’s Jawaharlal Nehru University, Ravi Srivastava says that taken together, central and state expenditure as a percentage of GDP has not increased from the 1990s. That means the fault does not lie in policy design. The solution lies in political will and robust leadership at all levels of government. Outcomes will follow.